What shoes with my A-line midi skirt? Which shoes should be worn with a pencil or A-line skirts? I tend to live in black ankle boots, with a mid heel, but I think those type of skirts tend to look better with high heels. 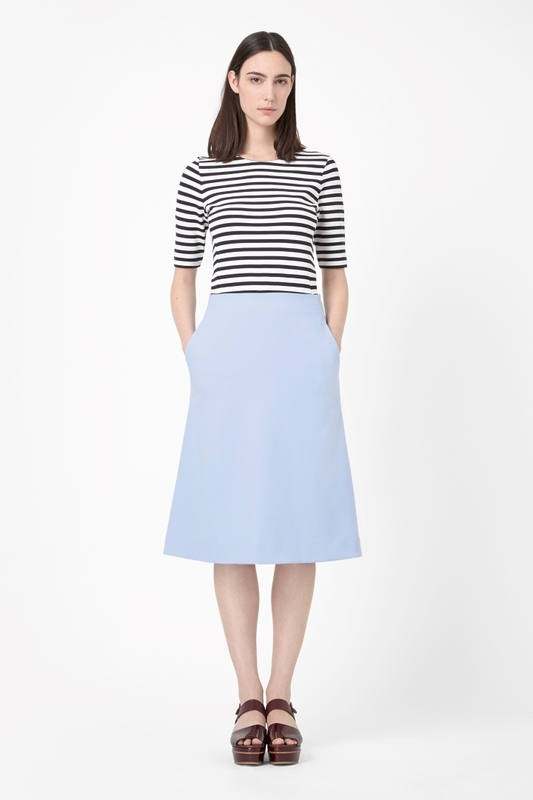 I’ve recently bought a pale blue A-line skirt from Cos that finishes just below the knee and I think it looks a bit frumpy with lower heels (and I don’t really like high heels). Even if some fashionistas are stating that the midi A-line skirt with flats is fashionable, mostly, it indeed looks frumpy so if you feel like it and do not like it, then avoid wearing flats with your skirt. The best choice to look youthful with that mix is to use sneakers. When you wear it with low ankle boots with a mid heel, that can be a fashion statement that is regarded as stylish too but that is not the fashion trick that will give you a slender silhouette for sure. The boot slightly cuts the calves and as do the skirt. That do not leave us with much choices if you do not like the high heels does it? So I’d advice… high heels anyway. But if you don’t want to too much arch under your feet you can try the almost flat wedge as seen in the COS look book above. Otherwise you can go for high heeled pumps, very mad men. Mid heels are fine. 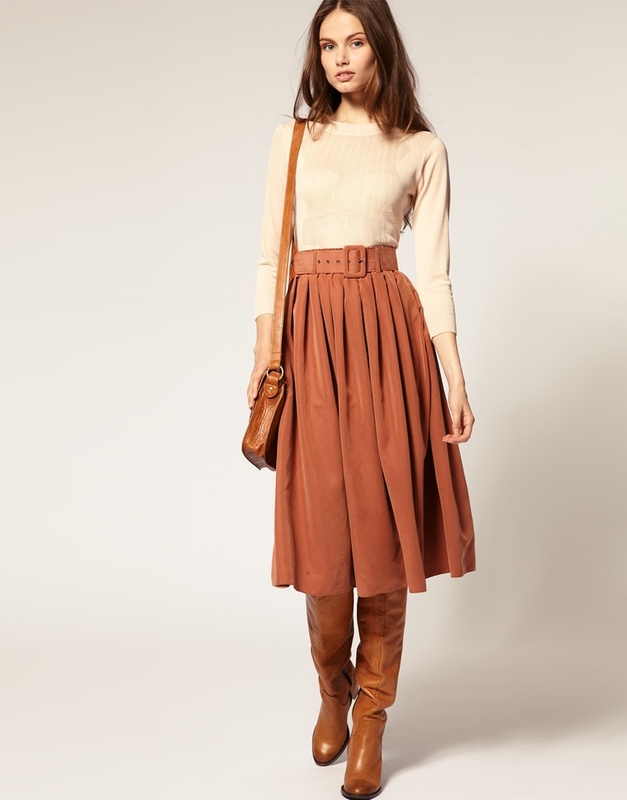 Or for high heeled high boots, so seventies. If you choose them with a wedge and not too much arch that shall be comfy. C’est vrai que le look bottes jupe est vraiment sympa. Dans ces couleurs fait un peu cow-girl je trouve ! Love this post! In summer, heeled clog sandals look really nice too. Very seventies! Thank you for this post, I really like the lady in the grey jumper and will invest in some similar shoes!